Bloomberg's report, "Soros Loses Case Against French Insider-Trading Conviction," indicates that an appeal based on a "human rights" violation against Wall Street speculator George Soros has been rejected by the "European Court of Human Rights." Soros, who was convicted and fined for insider trading in 2002 regarding French bank Société Générale shares he bought in 1988, has built an empire out of obfuscating global criminal activity with the cause of "human rights." Image: Soros runs a global empire of NGOs leveraging "human rights" to cover up institutional criminality just as he himself just attempted to use "human rights" to excuse criminal insider-trading. Soros' disingenuous use of "human rights" is not a strategy he holds an exclusive monopoly over, but rather one he executes in concert with very unlikely allies - Neo-Conservatives of the US State Department-funded National Endowment for Democracy and its various subsidiaries. The court's decision in rejecting the appeal was based on Soros being “a famous institutional investor, well-known to the business community and a participant in major financial projects,” and thus should have been “particularly prudent” regarding insider-trading laws. The contents of Soros' appeal, based on "human rights" was not heard, and the details of the appeal not yet made public, however, it is an illustrative example of how Soros and global elitists like him leverage the legitimate cause of human rights and freedom as a means to execute and defend both individual and institutional criminal behavior. Soros has built a global empire of networked nongovernmental organizations (NGOs) allegedly promoting "human rights," "freedom," "democracy," and "transparency." His Open Society Institute funds amongst many others, Amnesty International (page 10), Global Voices, and Human Rights Watch. In reality these NGOs constitute a modern day network of imperial administrators, undermining national governments around the world and replacing them with a homogeneous "civil society" that interlocks with "international institutions" run from and on behalf of Wall Street and London. And contrary to popular belief, Soros has built this empire, not against "conservative" ambitions, but with their full cooperation. It is difficult to find a cause Soros' Open Society Institute supports that is not also funded, directed, and backed by the US State Department-funded, Neo-Conservative lined National Endowment for Democracy (NED) and its various subsidiaries including Freedom House, the International Republican Institute (IRI) and the National Democratic Institute (NDI). George Soros and his Open Society Institute also played a leading role in the unfolding unrest. Soros, in addition to fully supporting many of the NGOs in tandem with NED and the US State Department, also funded opposition groups working well in advance to produce new "constitutions" for collapsed nations. It turns out that the new Egyptian Constitution has already been drafted, not by the Egyptian people, but by the very US-backed protesters who brought about regime change in the first place. A Reuters report quoted an opposition judge, who had been hiding-out in Kuwait until Mubarak's ousting, as having said civil society groups had already produced several drafts and a new constitution could be ready in a month. These 'civil society' groups include the Arabic Network for Human Rights Information openly funded by George Soros' Open Society Institute and the Neo-Con lined NED funded Egyptian Organization for Human Rights. It appears that while the International Crisis Group may be turning out the strategy, and their trustee ElBaradei leading the mobs into the streets, it is the vast array of NGOs their membership, including Soros, fund that are working out and implementing the details on the ground. The entire opposition in the Southeast Asia nation of Myanmar, still known by its colonial nomenclature in the West as "Burma," is a creation of Wall Street and London. This includes the growing personality cult of "democracy icon" Aung San Suu Kyi. And again, just as we saw during the Western-engineered "Arab Spring," it is a tandem effort made by "right-wing" Neo-Cons within the confines of NED, and Soros' Open Society Institute. 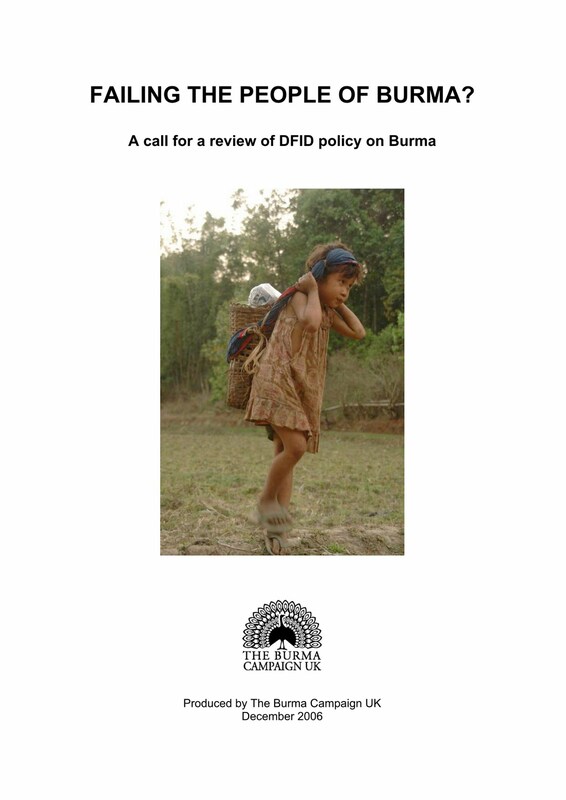 Image: The 2006 Burma Campaign UK report, "Failing the People of Burma?" (.pdf) reveals the entire "pro-democracy" movement, including Aung San Suu Kyi herself, is a product of US and British funding and the building of neo-imperial networks designed to overthrow and replace the government of Myanmar. The restoration of democracy in Burma is a priority U.S. policy objective in Southeast Asia. To achieve this objective, the United States has consistently supported democracy activists and their efforts both inside and outside Burma…Addressing these needs requires flexibility and creativity. Despite the challenges that have arisen, United States Embassies Rangoon and Bangkok as well as Consulate General Chiang Mai are fully engaged in pro-democracy efforts. The United States also supports organizations, such as the National Endowment for Democracy, the Open Society Institute (nb no support given since 2004) and Internews, working inside and outside the region on a broad range of democracy promotion activities. U.S.-based broadcasters supply news and information to the Burmese people, who lack a free press. U.S. programs also fund scholarships for Burmese who represent the future of Burma. The United States is committed to working for a democratic Burma and will continue to employ a variety of tools to assist democracy activists. The report continues with a vast array of evidence exposing the tandem roles of both "liberals" and "conservatives" in executing a singular goal of undermining a foreign government and replacing it with neo-imperial administrators that interlock directly with "international institutions" that answer directly to Wall Street and London. Like in neighboring Myanmar, efforts have been long underway to undermine the nationalist elements within Thailand and install a proxy government as well as a proxy system of governance to implement the global agenda of Wall Street and London. The proxy of choice is billionaire and long-time associate of the Bush family, Thaksin Shinawatra. As we've seen in the previous two examples, Shinawatra's association with America's Neo-Conservative establishment in no way inhibits the "liberal" George Soros from supporting movements that facilitate not only his re-installation into power, but the expansion of his globalist "neoliberal" brand of politics -- which of course benefit once again Wall Street and London in general, not any particular political persuasion. In the example of Thai propaganda front "Prachatai," Soros' Open Society Institute and the Neo-Cons' National Endowment for Democracy have heaped annual funding as well as ongoing political support to the outfit's mission of leveraging "human rights" and disingenuous aspirations for "democracy" to mask Shinawatra and his movement's criminal activities. NED subsidiary, Freedom House, is in fact chaired by Neo-Con Kenneth Adelman who served as Shinawatra's lobbyist and also serves as a trustee on the Soros-funded and chaired International Crisis Group. Prachatai's spinning of their collective agenda as "progressive" rather than one wrought of foreign corporate-fascist funding is a perfect example of Soros' modus operandi. In a fourth and final example, Soros and his Neo-Conservative counterparts can be found behind Russia's motley opposition and their "Arab Spring-like" attempt to overthrow the government of Vladimir Putin. The entire grounds justifying Wall Street and London's street mobs were calls of a "rigged" Russian election. Those making such accusations included National Endowment for Democracy-funded GOLOS and the Soros Open Society-funded Organization for Security and Cooperation (OSCE) (.pdf page 125). 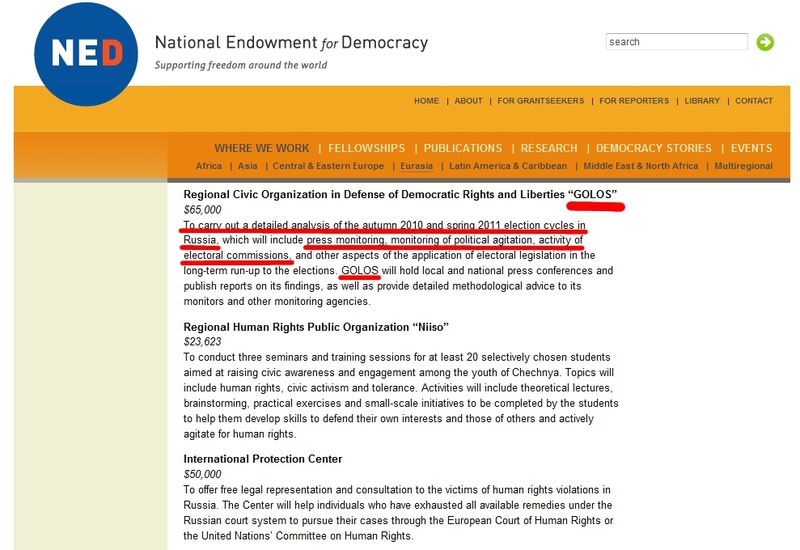 Image: A screenshot from US National Endowment for Democracy's (NED) website indicating its funding for "independent" poll monitor Golos. USAID also funds Golos. And while the lion's share of support for Russia's multiple opposition groups comes from the National Endowment for Democracy and its subsidiaries including Freedom House and the International Republican Institute chaired by John McCain, jailed Russian oligarch and opposition leader Mikhail Khodorkovsky fashioned his entire "Open Russian Foundation" after Soros' Open Society Institute. It should be noted that Khodorkovsky had both Jacob Rothschild and Henry Kissinger chairing his contrived "foundation." Clearly there is more behind Soros' funding of NGOs globally than mere "liberal philanthropy." That he carries out this funding in concert with notorious warmongers, corporate fascists, and confessed Neo-Conservatives indicates a very malicious and disingenuous agenda driving not only his "charity" but also the maintaining of his deceptive "liberal" persona. Soros' most recent attempt to leverage "human rights," not for a global campaign of achieving economic and geopolitical hegemony, but rather on behalf of defending his own criminal behavior, lends further evidence to the fact that the West, through its vast networks of NGOs and "international institutions," is merely hiding immensely depraved, craven criminal activity behind the facade of "humanitarian concerns" and "progress." With Soros' latest appeal being rejected, and his criminal conviction upheld, let us resist the temptation of resorting to "left-right" bickering and recognize the grander plot that has been exposed. Soros AKA Schwartz a rich & busy bee. NED a CIA subversion outfit who have been after Hugo Chavez for a decade. Rogue nation - any nation that repels foreign invasion by NGOs (nee jew trojan horse). NGOs are funded with our money, as qualified non-profits. The jews running them take in huge salaries with all expenses paid. Imprison Soros first, then go for the rest of the these insects.